I so enjoy when I can read a book that offers me a glimpse into a culture that is different from what I know. 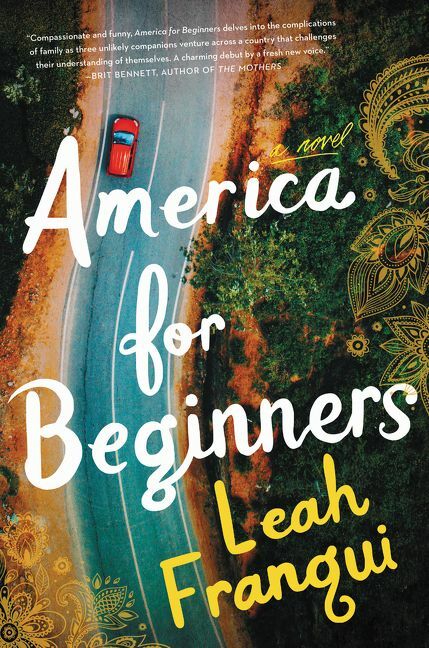 America for Beginners by Leah Franqui offered that as well as a universal story of searching for answers but finding so very much more. This book opens with Pival, a widow being basically browbeaten by her maids. She lives in India and instead of following the customs expected of her she has booked a trip to America – alone. Her maids are wailing that she will be attacked and never come home to them. They don’t know why she wants to make the trip. To them she is the quiet mouse the master married. But there is more to Pival than they know. They did not know her when she was young and vibrant. All her vitality was worn away by a husband who expected perfection and allowed for not a single wrong step. From her or their son. Their son who went to America and then told them he was in love with a man. Her husband disowned him, never talked to him again and didn’t allow Pival to either. Then he told her he was dead. Pival has decided to go to America to learn about the country that stole her son. She wants to find the man that “perverted” him and she needs to know if he really is dead. So she books her trip with a bit of a con man. He promises her a real Indian guide and a companion as she does not want to be alone with a man that is not her husband. These three unlikely people will embark on a cross country trip that will change all of their lives. The young guide and the actress hired to be her companion are both dealing with issues as they embark on the trip. These three strangers from three disparate backgrounds somehow manage to travel and learn together. After they reach the West Coast each goes back to their life changed and I would say invigorated. I was fascinated with this book. The characters were intriguing and compelling. Each one had depth and nuance. I felt for Pival – she was a force until this man she married destroyed all she was until she was just a shell of her former self. But then she found a small step back and another and another. The book held so much sadness yet so much hope too. There was love and laughter, happiness and pain. It was a book about life. It’s not the type of book you can just breeze through – it requires your attention but it is attention worth giving. Ms. Franqui is an author I’d very much like to read again.